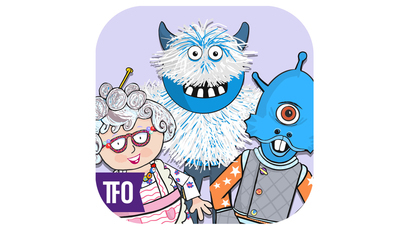 Minivers is also available on Mini TFO A section just for the kids, without ads! Click to explore! In the Minivers, our colourful characters are always up against a challenge! But no need to panic! They always find a friend to help them and teach them through games, and lots of singing and laughing! Bisbille has done it again! This time he´s covered Lexie´s room in bananas! He challenges Lexie to find him, and she bites! The search is on! Will she be able to find Bisbille? LEXIE est dans son lit et se réveille. viens de te réveiller toi aussi? LEXIE met le pied par terre et glisse sur une peau de banane. Il y en a partout sur le sol. pas 12. Wow! Quel désordre! Wow! Qui a fait ça? LEXIE sort de la chambre, puis revient aussitôt. LEXIE va s'habiller. Sur le plancher, deux Couclous, des petits personnages animés, se rencontrent. TOTO, le Couclou vert, glisse sur une peau de banane. TACO, le Couclou orange, éclate de rire. LEXIE se promène à l'extérieur, marchant entre les peaux de banane. PERROQUET est perché sur un banc de parc. vous avez vu mon ami Bisbille? à l'une de mes devinettes. que tu veux m'aider? Super! le plus souvent à leurs enfants? Essaie les voyelles en premier. le «O», «B» «I» «C». Non pas où, mais sur quoi. Je te donne un indice. Il y a pas de quoi. Plus loin, MAMIE GÂTEAU cueille des pommes dans un pommier. LEXIE vient à la rencontre de MAMIE GÂTEAU. vais me faire une tarte bientôt. Ah, puis je vois très mal. MAMIE GÂTEAU trébuche, mais LEXIE l'empêche de tomber. de tomber dans les pommes. Ha, ha, ha! Dans les pommes! Ah, elle est bonne, celle-là! Oh! Ça me donne une idée! on lui chantait une chanson? Ah, bonne idée! Ha, ha, ha! LEXIE et MAMIE GÂEAU se tapent dans les mains. LEXIE et MAMIE GÂTEAU chantent une chanson et dansent une chorégraphie. Caché derrière un arbre, BISBILLE le singe observe la chorégraphie. BISBILLE sort de sa cachette et vient danser avec LEXIE et MAMIE GÂTEAU. Oh ouh, oh ouh, oh ouh! BISBILLE trouve les lunettes de MAMIE GÂTEAU par terre et les enfile. les lunettes de Mamie Gâteau? BISBILLE remet les lunettes à MAMIE GÂTEAU. cuisiner. À plus tard. Didlidou! BISBILLE va pour s'en aller, mais LEXIE le retient. ma chambre de pelures de banane. devrais m'aider à les ramasser? mon ami. À plus tard. BISBILLE essaye encore une fois de s'en aller. Haha! Pas si vite, Bisbille. LEXIE et BISBILLE s'en vont.TOTO arrive en planant, toujours en train de glisser sur sa peau de banane. Xux stumbles over a rake and takes a fall. When he gets up, he´s all woozy and can´t remember what he wanted to write. No need to panic, as Josée is there to help him remember. All it takes is the alphabet song! Xux wants to run with Josée, but he doesn´t have the right shoes. When he finally finds some running shoes, he finds out that he doesn´t know how to tie the laces. Josée to the rescue! She shows Xux the bunny ears method. Christopher and Yeti are watching a hockey game, but just as Yeti wants to shout out his support, he notices his voice is gone! Oh no! How can that be? No need to panic! Mamie Gâteau has just the thing to help. The two friends set off to her place. Christopher and Mamie Gâteau are intrigued to find a sock missing from the clothesline. Mamie has just the thing to find it, though: a sock detector! Our two hunters set off on a quest to find the roaming sock. While Lexie is gardening, a flowerpot falls on Monsieur Gédetou´s head. Crack! No need to worry about the merchant; he´s fine. The poor plant, on the other hand, is not looking good! It needs to be repotted, and quick! Xux is excited; he´s seen a bird, and wants to catch it. Christopher wants to help, but how can they lure the bird over to them? Why, by putting some food in a bird feeder, of course! Oh no, Mamie´s hands are stuck together! Lexie absolutely wants to help her out, but she first needs to figure out how they got stuck together in the first place! Zax, Xux´s cat, has gone missing! The alien is fretting, but fortunately, Josée is there to help. The two friends put their detective hats on to find the poor pet. First thing to do: go back to where the cat was last seen. Josée and Xux want to play basketball, but it´s starting to rain. Xux is undeterred, and wants to play no matter what! Luckily, these two friends know a cloud-chasing song they can sing. Josée is having some friends over to eat, but her meal is missing a key ingredient. No big deal! Monsieur Gédetou can surely help her out! But what´s this? Monsieur Gédetou has a hole in his pocket, and he lost the cheese needed for the recipe! Lexie hears a strange noise... where is it coming from? Her friend Yeti has the hiccups! Lexie tries a few things to chase them away, but it´s not as easy as it looks! Xux is taking dance classes with Mamie Gâteau. He still needs a fair bit of practice, that´s for sure! Christopher wants to help, but the music isn´t playing! Can anyone fix the radio? Xux had another accident while flying his saucer home. Josée offers to help him find his way back to his planet. On their way there, they stumble upon a planet that... stinks! Bisbille is shaking and shimmying and itching all over the place! Lexie thinks she knows why--fleas! Bisbille needs to take a bath, but there´s only one problem: the little guy hates water! Xux has an accident on the way to his singing class. But thankfully, crafty Christopher is there to help! Xux has to show Christopher how to handle the flying saucer without it breaking down! Josée is packing for a trip to the Great White North! But... Where did her boots go?! They were right here two seconds ago! The banana peel on the floor leaves no doubt: Bisbille the monkey is up to no good again! She sets off to find him.